It’s only a movie – The final screening! This is it: after six years and 150 films, It’s Only A Movie is closing its doors forever next week. We’ve brought you everything from KING KONG to THE KEEP, CRITTERS to CLUELESS, DJANGO to DEEP BLUE SEA and HEATHERS to THE HITCHER, via a slew of campy Christmas horror movies, a veritable feast of VHS classics, a DEAD SNOW double bill and more John Carpenter than you could shake a stick at. Have we paid our dues? Yessir, the cheque is in the mail. So it’s time to take off the glasses and dismount the Pork Chop Express. 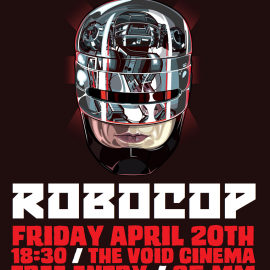 But we couldn’t go out without one more cult extravaganz…a: Paul Verhoeven’s ROBOCOP on glorious 35mm. You can view this event on Facebook here and see our initial tweet here. Come along – let’s make this a fabulous farewell screening!